The EMCORE Optiva OT-CC-6 1 RU 19″ rack-mount, fan-cooled enclosure is a ruggedized aluminum housing unit that accepts any Optiva insert card. This high-capacity 6 slot chassis provides a state-of-the-art platform for density and space utilization. A wide variety of Optiva cards have been developed for this platform including RF and microwave fiber optic transmitters and receivers, optical amplifiers, RF and optical passive devices, video, audio, data, and Ethernet products. 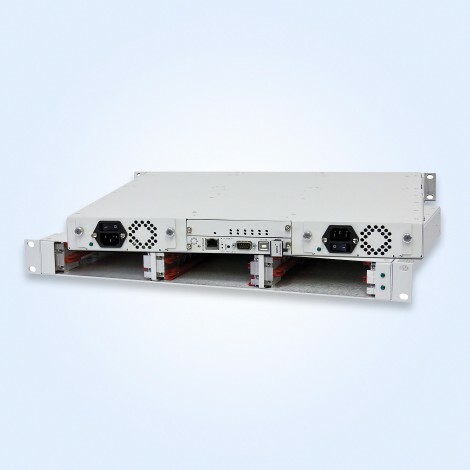 This 1 RU model features hot-swappable power supplies and insert cards. Options include LED indicators for power and status, as well as reversible rack-mounting ears. With the addition of an SNMP Management card, all chassis and insert card parameters may be monitored remotely.